Artist’s book: Hardcover edition with color illustrations, 118 pages. Available here. 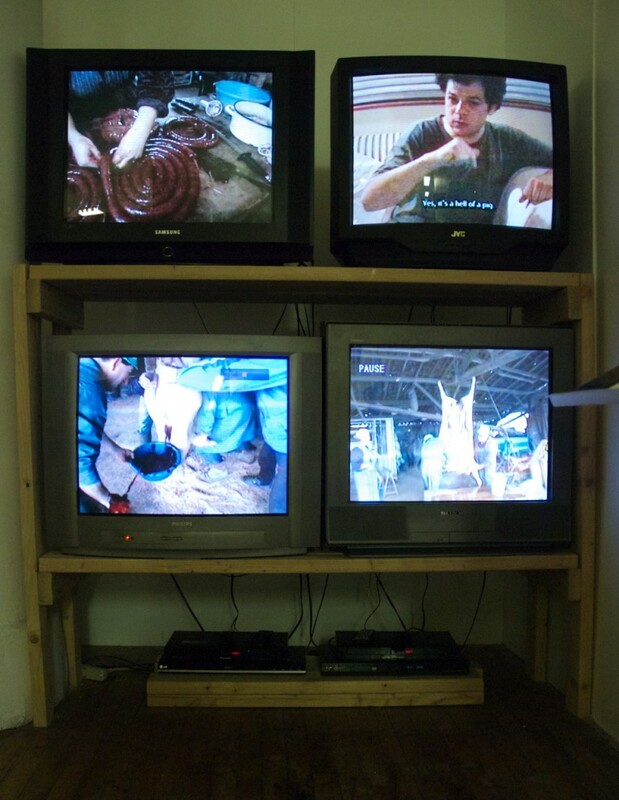 The Three-Legged Pig is a four-channel video and an accompanying artist book. The Hi8 video footage, shot January of 1998 on family farms in the Southwest of France, witnesses the respect given to the lives of pigs raised and prepared for food. I offered The Fourth Leg: a lesson in pig butchery at Postmasters Gallery in conjunction with the exhibition at the Center for Book Arts,. At the heart of the video installation is a 20-minute rendition of a joke by Yannick Pompele, boat mechanic, raconteur and gourmand. In his version, Yannick weaves the fabric and flavor of rural Gascony into a tale that is sometimes reverent and sometime scatological. On another channel of the video, a Gascon farmer with the help of his family and neighbors slaughters a pig by bleeding it. Then the pig is bathed and scraped, then gutted and hung in the cold winter air. Slowly it transforms from dead animal to meat. On the third track, the entrails, head, organs and other meat are made into various sausages, potted meats and cured meat such as ham. The fourth video follows Yannick’s family and their variations of blood sausage, jamboneau and other charcuterie. The recipes gathered during the making of the video are transcribed in the book along with the French/English translation of Yannick’s joke. The American version of the joke is provided after the slide shows. A traveling salesman is driving along a country road when he sees something weird by the side of the road—a pig with one wooden leg. So he pulls over and finds the house of the farm where he saw the pig. He pokes around until he finds the farmer and asks him what’s up with the peg-legged pig. “Oh, that!” He says. “Oh, well, about six years ago I was in the fields on my tractor when it hit a ditch and turned over. I was trapped under my tractor. The pig ran out and pulled me from the tractor before it blew up. That darned pig saved my life.